Dead Cow Wash, also known as "The Luge" is a great intermediate dirt bike trail located South of White Wash Sand Dunes between Green River and Moab Utah. The nickname "Luge" comes from the luge shaped slickrock in portions of the trail. The wash drains into the Green River and you are likely to find pools of water along the way. This time of year there can be ice as we've found. Depending on how much it may be impossible to reach the river and return back up the wash. This time we found patches of ice and pools of water but nothing significant enough to stop our progress. The ice and pools made it tricky to know how fast we wanted to go. Making our way back was a little less of a guessing game with the terrain. The main trail starts at what is referred to as the "Red Gate" as pictured on the map below designated by the flag icon. To reach the trail head follow the directions to White Wash Sand Dunes, then head South down the wash till you meet the road that follows South along the fence line. The road will end and either spur left to the Red Rim Trail, or Right down red gate and the beginning of the Dead Cow Wash Trail. Shortly after descending into the wash, you'll encounter a small cattle guard. Travel roughly West from this point down the wash. Towards the end of the wash there will be a fence restricting travel East up another wash. Exit the wash by going up the hill to the West, then immediately travel South. The real fun starts when this dirt trail/road ends and turns West again into another wash that will slowly turn Northward. 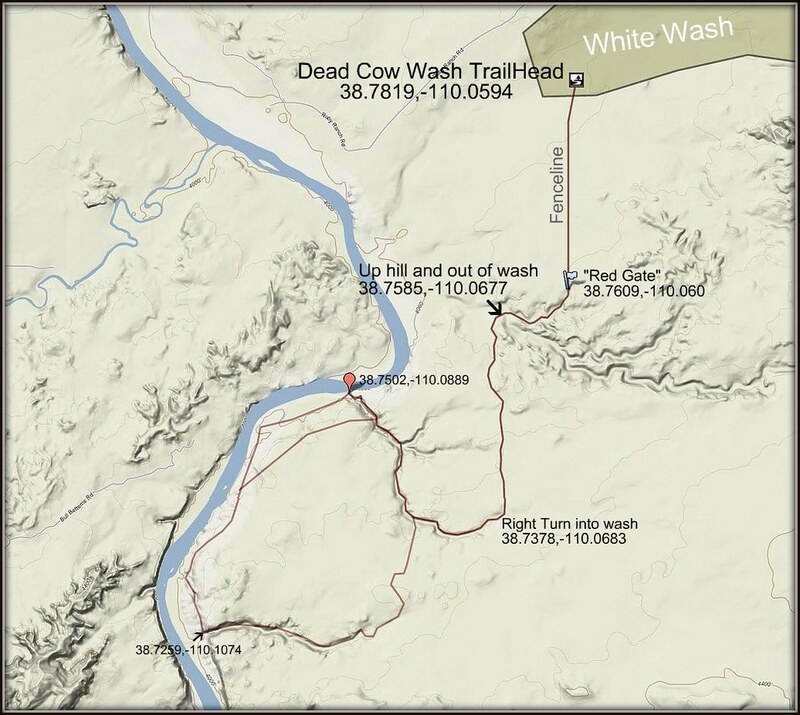 This wash will end at the Green River(red map icon). At this point we turned back up the wash, but you can continue West out of the wash again and make a loop and/or see some more views above the Green. View Printable Version of this map or a FULL PRINTABLE TRAIL MAP. Tony... that was a great ride. Thanks a bunch for being our guide. I dont think we could have asked for better weather that day. Can't wait to do it again!